TIP: Always label your spool with its line weight. Click this link to vist our ONLINE FLY SHOP. It’s early morning and the air is crisp. On a stream bed near you a fly fisher strips line off the reel with one hand while casting a fly and manipulating the fly rod with the other. Can you picture this scene in your mind? Can you see the fisherman’s face? Is it you? I go to sleep each night anticipating my next trip to that stream. Fly fishing reels are your friends, your pals, your amigos, your compatriots and your buds. You must treat them with kindness and respect. Like your dogs, you must be good to your reels or just when you need them the most, they will turn around and bite you. Feed your pets and maintain your reels. They have moving PARTS and although they may be sealed, you still need to keep them clean at all times. Today, the vast majority of fly reels are manually-operated, single-action reels of rather simple construction, with a simple click-pawl drag system. However, in recent years, more advanced fly reels have been developed for larger fish and more demanding conditions. These newer reels feature disc-type mechanical, adjustable drag systems to permit the use of lighter leaders and tippets, or to successfully capture fish that undertake long, powerful runs. Many newer fly reels have large arbors to increase the speed of the retrieve and to improve drag performance during long runs. 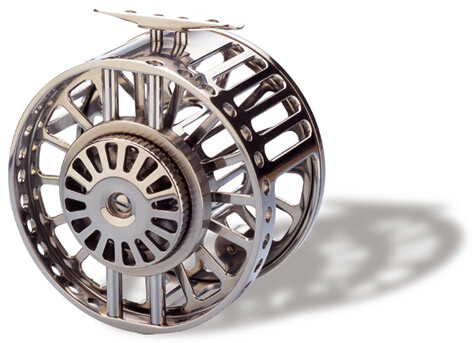 In order to prevent corrosion, saltwater fly reels often use aluminum frames and spools or stainless steel components with sealed bearing and drive mechanisms. 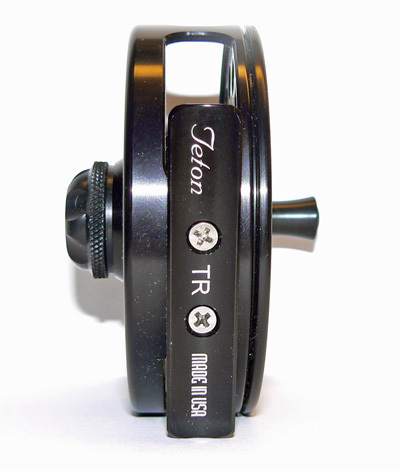 Some reels with simple click drags are designed to be “palmed” when a fish runs with the line. Palming allows the angler to add additional drag with a light touch of the palm to the rim of the reel. On some reels, palming is difficult or impossible because the spool is fully skirted. With such reels, the only drag that an angler can apply to the line is with one or more fingers directly pinching the line. The fly line can be retrieved using either hand. Most fly anglers are more comfortable with a left-hand retrieve. However, almost all modern fly reels can be converted to a left or right-handed retrieve in a matter of moments. Fly reels are often rated for a specific weight and type of fly line in combination with a specific strength and length of backing. For example, the documentation supplied with a reel may state that the reel will hold 100 feet of line when backing fills the first one-third of the reel spool. As well, almost all modern reels are designed to take interchangeable spools. Such spools can be quickly switched, thereby allowing an angler to change the type of line in a matter of seconds. There are a plethora of fly fishing reels on the market. How do you know which fly reel is best for your fishing situation? Do you need one, two, or many fly reels to accomplish your fishing goals? If you only fish "once in a blue moon", do you really need that expensive, state of the art fly reel? There are several other factors to consider before you purchase. The fly fishing reels' arbor size determines the rate of retrieval. Which ARBOR SIZE AND RETRIEVAL RATE is right for your type of fishing? Large arbor fly reels? Interchangeable spools? Do you need extra spools? DO YOU KNOW WHAT KIND OF MATERIALS MAKE UP THE BULK OF YOUR REEL? Many fly fishing reels are made overseas. Should that disqualify them from consideration? Maybe. Maybe not. First and foremost, check out the manufacturers warranty. How important is that warranty and who are the people standing behind them? Does the cost of returning a broken reel to the manufacturer exceed the cost of fixing it locally? A responsible manufacturer will repair or replace your reel for free or a nominal fee or the cost of the postage. CLICK HERE AND TAKE A GANDER AT SOME OF THOSE WARRANTIES. There are 18,000,000 fly fisherman today. They come in all shapes and sizes. Everyone is welcome. Yes, even geeks. To be assured that you are getting the most relevant, up to date information possible, we update regularly. If you would like information on a particular product or have a question on any fishing topic, please contact us and we will answer you promptly.A Contact Us form will be coming shortly. At Fly Fishing Discounters we reduce, slash, cut, decrease, deduct, knock-off, markdown, rollback,and otherwise take a good percentage off the MSRP of all fly fishing reels, but always with an eye toward giving you the best value for your dollar, yen, pound, peso, etc. For further information, contact us or visit our ONLINE FLY SHOP.